A few weeks ago I had the wonderful opportunity to attend the 2016 Families in Global Transition Conference in Amsterdam. It’s the third time I attend this conference and every time I find myself re-energized and grateful for this international community. It’s a space where I don’t have to explain myself or my background; I feel welcomed, understood and heard. This year we had three spectacular keynote speakers, including the founder of FIGT and Third Culture Kid/Cross-Cultural Kid advocate, Ruth Van Reken. Ruth is so much more than that, however, so in her honor I would like to share my interview with her from 2014. That was the first year I attended FIGT and the first time I met Ruth – her warmth, humor and genuine interest in everyone she meets made a lasting impression. It was a privilege to interview her in 2014 and to hear her speak this year. Certain names immediately come to mind when thinking about Third Culture Kid (TCK) research: Norma McCaig, Ruth Hill Useem, David Pollock and of course, Ruth Van Reken. It is difficult to find just one word that defines Ruth, who is a missionary kid, an Adult Third Culture Kid, author, teacher, public speaker, and advocate of TCKs, among many other things. She was born in Kano, Nigeria to an American mom born and raised in Chicago, and an American ATCK dad born in Resht, Iran. She spent much of her childhood in Africa, returning to the US. for high school. As an adult, Ruth went to college, became a nurse, and then met and married her husband, David. Also a missionary kid and TCK in his own right, having lived two years in China as a child, David is also a doctor and as he wanted to work overseas, Ruth continued her expat life with her husband, raising three global nomads of her own in Liberia and the US. As an Adult TCK, daughter, mother and grandmother of TCKs, Ruth knows the impact of this lifestyle and the importance of understanding it. She is dedicated to helping others understand their journey and to spreading the word about this global community. Without Ruth there would be no TCK ‘bible’ (Third Culture Kids: Growing up Among Worlds) and no Families in Global Transition (FIGT) conferences. The two publications Ruth is most known for, Letters Never Sent and Growing up Among Worlds, were written under very different circumstances, but they both helped Ruth (and others) understand their own TCK background. Finally writing about her experiences, at 39 years old, helped her process the emotions she had felt growing up as a TCK, especially about leaving home and going to boarding school. Expressing those emotions allowed her to finally address them and cope with them. “This was not a book about a topic but simply a process of self-discovery,” she explained. Her story resonated with many readers, and it continues to do so today, having sold over 32,000 copies. But when Ruth first wrote Letters, she had a hard time getting it printed because publishers didn’t believe there would be enough interest in her story. From there Ruth did the selling herself until her collaboration with author and publisher Jo Parfitt, which allowed her book to receive the exposure it deserved. Jo revamped Letters by adding photos, an epilogue by Ruth, and making it available in print and kindle ensuring Ruth no longer had to sell it herself. The book initially shunned by publishers would go on to impact people all over the world, who realized they weren’t alone in how they felt. By sharing her experiences and emotions, Ruth has helped others to learn from her lessons and ultimately live better in their understanding. It was while working on Letters that Ruth and David Pollock first connected. He was preparing a conference on TCKs and she sent him a letter asking if he was doing anything to help adults struggling with their TCK experiences. That one letter led to a great friendship and collaboration. Working on Growing up Among Worlds was a very different process to writing her journal. David had done much of the research but someone needed to put it in writing and make it available to others. In addition to writing it, there was also a need to clarify the whys of such a lifestyle, which were the challenges Ruth took on. Trying to explain the impact of growing up as a TCK also helped her understand herself better. FIGT had very humble beginnings in the Midwest USA. While trying to adjust to life in suburban Indiana after living overseas, Ruth realized that not enough help was being given to relocated families. Although relocation packages included nice benefits and practical information, they lacked support in other areas. In the meantime, Norma McCaig had started Global Nomads and David Pollock was talking about TCKs to international schools and organizations. Ruth’s memoir, Letters Never Sent had been published and people had begun writing to her, sharing their own similar experiences. “It was apparent that issues related to global family living were real out in the world but they seemed invisible where I was living in Indianapolis,” she recalled. Then one day while sitting at her kitchen table with three friends, discussing the book she was writing with David Pollock, they realized it would be great to spread this information to a wider audience. And so began the preparation for the first FIGT conference. They found a venue, set a date (May 16th 1998) and created a logo, which is still used today. They even found a star speaker: David Pollock. At the time he was Executive Director of Interaction International (formerly Manhattan Youth Services), which he had co-founded in the 1960s. Few locals attended the conference, but many people traveled into town to hear David speak and ‘the magic of FIGT began’. Although that first conference only had two sessions, it was so successful a second one was planned the following year and by 2001 FIGT had become an official organization. The conference was eventually moved from Indianapolis to Houston where there was a larger international community due to the oil industry, before moving to its current home in Washington, DC. “Throughout the process, incredibly dedicated and capable board members […] have continued to lead the way to making FIGT what it is now,” she said. Although David Pollock is gone, his legacy continues, not only through the knowledge he has left behind, but also through his son Michael, who led a Concurrent session with Ruth at the 2014 FIGT conference. Another evolving aspect of FIGT is the bookstore. At the first conference there was no bookstore – there wasn’t even a book table. Ruth’s husband sold them straight from the boxes in the lobby towards the end of the conference. “No one believed there was enough interest in such a topic to generate many sales,” Ruth recalled. The main books available at the time were Letters Never Sent by Ruth and Strangers at Home by Carolyn Smith, a US diplomat’s daughter. The following years there were more, including Growing up Among Worlds as well as publications from Jo Parfitt and Robin Pascoe. But unfortunately the choices remained quite limited. Today there is an online bookstore and a physical bookstore at the FIGT conferences filled with a myriad of expat and TCK-related books. Ruth is currently working on new research regarding Cross-Cultural Kids (CCK). She wants to see how certain lessons can apply to all children who have experienced a globalized upbringing or some form of displacement from their parents’ home/culture. Her hope is that by understanding the TCK experience it is also possible to help children from other cross-cultural backgrounds. She hopes to expand our views of who constitutes a global nomad and to use our past lessons to benefit them. “If we have identified the gifts TCKs often receive from their cross-cultural childhood […] then is it possible those with other types of cross-cultural backgrounds […] have the same kinds of giftings?” she questioned. She is also hopeful that future generations of TCKs/CCKs will continue to carry the torch for the global community. “Now we are in TCK Phase Two, watching your generation move into its place in the history of the world and build on the past so lessons learned can be applied to the present and prepare others to live well in a future where I believe CCKs of all backgrounds will be the norm and not the exception,” she said. Although she speaks of passing the torch to the next generation, Ruth is far from done with her work. She continues to travel to conferences and schools speaking about TCKs and how to help them understand and make the most of their experiences. Meeting Ruth was a highlight of the conference for me – I was immediately won over by her kindness, humor and warmth. She seems to have time for everyone, despite being in constant demand. She is modest and humble, almost to a fault, which only makes her more charming. She has done so much for this community and yet always downplays her contributions, preferring to give the credit to others. Thankfully those around her are willing to sing her praises and give her the recognition she deserves. Ruth had endless wisdom to share, both when we spoke at FIGT and when I interviewed her after. She knows that growing up as a TCK/CCK is not simply good or bad. There are challenges and sorrow, but there are also amazing opportunities and happiness. Sometimes we forget that the ups and downs are both necessary parts of life. After these many words of wisdom, she shared one final piece of advice, which she has carried around her whole life. In an increasingly mobile world, perhaps that is the greatest piece of wisdom. Je suis consciente que des attentats ont eu lieu dans d’autres pays (Liban, Iraq) avec de très nombreux morts et qu’il y a des victimes tous les jours en Syrie et ailleurs dans le monde. Le but du texte ci-dessous n’est pas de donner plus d’importance aux victimes de Paris, parce qu’aucun pays, aucune famille ne mérite de subir de telles atrocités. Ce texte est simplement un hommage à une ville que j’aime profondément. Je suis 100% libanaise d’origine et Paris sera mon foyer éternel. Mon cœur est doublement brisé et ma peine est débordante. Je pleure pour ma ville bien-aimée, mon cœur brisé déborde de tristesse. Paris – ville adoptée, adorée et chérie – tu souffres et je souffre loin de toi. Même si un océan nous sépare, mon cœur est avec toi et mes pensées traversent les distances et les vagues pour se poser à ton seuil. Enfant du monde, mon âme est un mélange de cultures et mon cœur repose souvent dans plusieurs endroits, mais il ne quittera jamais Paris. Cette ville lumineuse a su bien s’emparer de mon cœur et c’est un amour éternel. Il y a tellement de choses que je voudrais dire, mais je me retrouve sans mots face à ce tourbillon d’émotions qui remplit mon cœur et mes pensées. Photo courtesy of Raya F.
This article first appeared in the September 2015 issue of Among Worlds. Over the past couple of months the topics at #TCKchat have continued to be varied, thought-provoking and insightful. We finished our series of chats on race, culminating with a conversation about cultural and racial identity. We discussed the Third Culture Kid (TCK) ‘label’, and current/ future research topics for TCKs. We looked at how sports can be an important connector and tool to engage in your community. We also shared thoughts, advice and suggestions on creating and maintaining a global career. As this issue of Among Worlds is focused on new beginnings, however, I would like to jump back a few months to a #TCKchat we had in September 2014 entitled New Kid on the Block. The saying ‘practice makes perfect’ can apply to many things in life, but not to everything unfortunately. I’ve been the new kid quite a few times and I don’t think it really gets easier or better the more you do it. Sure, you might get more used it and as the years go by you’ll be more mature so you can handle it differently. But, on the flip side, as you get older, feelings get more complex and there’s more to juggle. Being the new kid at school is never easy. It can be stressful, embarrassing, upsetting and lonely. Throw in a foreign country, a different school system or a new language and it becomes even more daunting. Sometimes there might not even be the comforts of home and personal belongings – they might still be shipping from across the world as you stay in a hotel. By the time I was eighteen, I had lived in six countries (on four continents) and had gone to five different schools. I attended international/ American schools in Mexico, the Philippines and France; local schools in the U.S. and Australia; and then went on to study in French and British universities. I know all too well how it feels to be the new kid. Although I was lucky to have supportive parents and a sister who shared the transition struggles, I still had to navigate the school days on my own. I had to talk about myself to unfamiliar faces, through the nervousness and sadness; I had to correct teachers on the pronunciation of my name; I had to find somewhere to sit at lunch and try not to feel too lonely. I don’t think more practice could have made any of that much easier. Although the first days and weeks were tough, I always settled in eventually. I made friends, found my way around the school and one day, I was no longer the new kid. But I knew how difficult it was to feel so lost and alone, and I learned that the smallest gestures of kindness could make an enormous difference. I took that lesson to heart and decided I would do everything I could to make the experience easier for other new kids. I initiated conversations with them and asked if I could help out. I looked out for them and if I ever saw someone who looked lost or lonely, I would introduce myself, offer to help them find their way, or simply talk to them and get to know them. Sometimes all you need is to know that someone cares. Having the right kind of support during these transitions is so important, and I am grateful for those teachers and students who reached out a helping hand. I am even more grateful to have parents who were always supportive and reassuring. They did everything they could to help us navigate the tough parts of these experiences and cope with all the changes in our lives. Having siblings also made things infinitely easier – it was comforting to know I wasn’t alone in how I was feeling and what I was going through. We didn’t need grand gestures to help us through those moments. We simply needed a friendly smile, a sympathetic ear, a shoulder to cry on, a comforting hug – something that reminded us we weren’t alone and that everything would be alright. I won’t pretend that moving was (or is) easy. Leaving behind all that’s familiar and starting somewhere new can be daunting and overwhelming. There are bound to be moments of sadness and loneliness. But it is also an exciting adventure, with wonderful opportunities. Being the new kid is never easy and new beginnings are always a little scary. Yet before you know it, you’ll know your way around school, you’ll be giving directions to tourists, and you’ll be calling that strange, foreign place home. At #TCKchat we discussed being the new kid – sharing thoughts on how to make friends, who helped us through the transition, how we coped with being the new kid and finally offering up some advice for others going through similar challenges. What type of a TCK were you when you first moved to a new place? Chameleon? Observer? Did you jump right in or have your guard up? What was your strategy for making new friends? Who helped you adjust? Teachers? Counselors? Peers and/or classmates? What advice would you give a kid about to make their first move? An earlier version of this piece was first published on my blog in June 2013. The version below was published in the September 2015 issue of Among Worlds. Many things come to mind when thinking of summer: sunshine, ice-cream, vacation, lounging on the beach, late nights, cool drinks, lazy days and evenings with family and friends… But for me, and many other Third Culture Kids (TCKs), summer was also synonymous with change. In the American and/ or international schools we attended, when June came along and the school year ended, there was always someone moving away. Sometimes we had to say goodbye to friends who were leaving and other times we were the ones packing up. Either way it meant change, adapting to yet another new situation and having to figure it out all over again. When we were moving there were obviously greater challenges and those summers were truly a period of transition. During those summers, we rarely went directly to the new country. Once school would finish in June, we would pack up the house, ship everything off with the moving company and we would head off to spend at least part of the summer with family. That way we could enjoy our vacation as much as possible before having to confront the inevitable challenges awaiting us. It was a great idea to allow us this transition period, this pause, in between countries. It softened the blow of leaving our home and gave us strength to deal with arriving in a foreign place. Spending the summers with cousins and grandparents – being surrounded by loved ones and familiarity – eased the pain of loss and of sorrowful goodbyes. It reminded us that some things remain constant and steady, even when everything around us seemed to be a whirlwind of change. It also reinforced our belief that time and distance do not alter true friendship and love. Summers are meant to be a time of joy, fun, laughter and carefree days. For TCKs moving to a new country the summer was much less carefree and relaxed. While others were still enjoying their last lazy days of lounging in the sun or chatting with friends, we were unpacking boxes in an unfamiliar house, trying to find our way in foreign roads and dreading the first day at a new school. It wasn’t always easy, but it was all part of the experience. And despite all the tough moments, I would do it again, without a doubt. Those summers of change provided valuable lessons that will last me a lifetime and they taught me how resilient I really am. A restful summer is always welcome, but show me the next opportunity for change and my TCK itchy feet are ready for the next adventure! I hope you all had a great summer, wherever you may be; and good luck to any of you who went through a summer of a change. Adult Third Culture Kid (ATCK) and writer Kathleen Gamble knows what it means to live a global life. Kathleen has lived around the world – Burma, Mexico, several US states, Colombia, various countries in Africa, Switzerland and Russia. 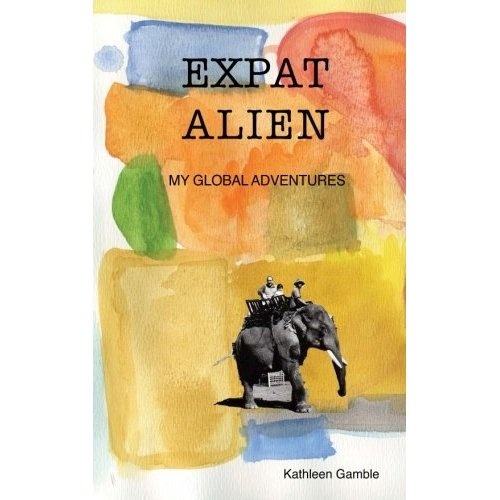 In her first book, Expat Alien, Kathleen takes us through her experiences and her history, starting from her parents’ first meeting and working her way through the many countries and continents since then. Throughout her book, Kathleen shares personal stories and anecdotes to bring her experiences to life. There is the more harrowing side of global living – political unrest in Burma, earthquakes in Mexico, or stopping at a roadblock in Nigeria and having a soldier jam his gun through the window. But there are also stories of friendships, boarding school in Switzerland, traveling through Europe, card games with family and making home across continents. Kathleen also delves into the difficulty of repatriation and reverse culture shock. When she returned to the US for college, she realized how different her upbringing was and found herself struggling to fit in and trying to understand the racial issues in the US. Despite the initial difficulties in settling in, Kathleen remained in the US for several more years before heading abroad again with her husband – this time to Russia. She lived nearly nine years in Russia, in six different apartments before returning to the US again. The stories of her time in Russia are fascinating and their unexpected departure following conversations with the FSB reads like a thrilling spy novel. Even though Kathleen and her son suffered through culture shock upon returning to the US, Kathleen managed to turn things around and create a new life. Despite passing through a few difficult moments in the years since returning, her book ends on an uplifting note of hope. Expats, TCKs, travelers and anyone interested in learning about various parts of the world through personal stories would enjoy Expat Alien. You can purchase Expat Alien on Amazon. Make sure to check out Kathleen’s blog www.expatalien.com to follow her latest adventures and also read more about her experiences growing up. You can also connect with Kathleen on twitter @ExpatAlien. I never expected that an animated movie could make me feel so much. That it could reach so far into my heart and find emotions and feelings that I thought were either gone or buried deep. Turns out they were just under the surface, waiting to be triggered. And maybe they will always be there. The movie I’m talking about is the new Pixar film Inside Out, which is about an 11-year-old girl (Riley), moving from her home in Minnesota to San Francisco. A lot of the movie happens in her head, where we see the different emotions (joy, sadness, disgust, fear and anger) personified as individual characters. It is beautifully made and I was blown away by how imaginative, creative and magical it was. I was equally impressed with how the filmmakers portrayed her emotions, how they dealt with sadness and how they showed the importance of acknowledging all emotions – because they all play a role in shaping who we are and how we live our life. It showed that sadness is not an emotion to ignore; it’s not something bad and shouldn’t be stigmatized. Sometimes all you need is to acknowledge the sadness, sit with it and let it out. Then you are more likely to find comfort and see the beauty and joy around you. When we ignore sadness or push it down, we don’t address it and often other emotions/ reactions come out instead – fear, disgust and anger. As Riley struggles with her emotions during this new transition she becomes confused, lonely and angry. Confused at how jumbled her feelings are, lonely without friends at her new school and angry that she was dragged away from her home and her friends. As a Third Culture Kid (TCK), this movie resonated with me in a way no other movie ever has. I felt like I was watching my story on screen. And I know my TCK husband felt the same. We felt the sharp ache of goodbyes; the deep loneliness of having no friends and eating lunch alone while others talked and laughed around you; the anger and confusion of being torn away from everything familiar and loved. But mostly we felt the sadness… And we were both caught by surprise at the intensity of our emotions. I’m now 30 years old, and I had a very healthy TCK upbringing. My parents were always supportive, they prepared us for every move, gave us closure and allowed us to grieve. So I thought all those emotions were sorted and neatly packed away in ‘long-term memory’ as the movie showed us. I never expected them to resurface so easily and to overwhelm me the way they did. But when Riley finally admits her sadness to her parents and says how much she misses home, the emotion was so raw, so real and so familiar that my heart overflowed… And so did my tears. But the beauty of the movie, and of life, is that once you acknowledge the sadness you can address it and you don’t have to deal with it alone. From there it’s uphill because you’re not fighting against it anymore and more importantly you’re not fighting alone. The movie shows that as Riley strengthens her relationship with her parents, makes new friends and slowly finds her place until this new location becomes home. And that’s how it worked every time for us – once you get past the heartache, loneliness and sadness, you make friends and you make a new home… At least until next time. I don’t regret this life and despite feeling such raw sadness, I loved the movie. It has so much wonderful humor and such poignant, touching scenes. It wasn’t a sad movie, but it also didn’t shy away from the sad moments. It embraced them and showed how they’re an important part of the bigger picture. I’m grateful that someone took the time to make such a movie and to make it so eloquently and beautifully. Words cannot really do it justice, so I would recommend this movie with all my heart. If you’re like me you’ll laugh, you’ll cry, you’ll think, you’ll be amazed by the magic of the movie… You’ll leave feeling inside out, upside down, jumbled up and moved to the core. But you’ll also leave feeling warm, buoyant and just a little more lit up inside. This article first appeared in the March 2015 issue of Among Worlds. Minor corrections have been made to reflect the most updated information (dates/times, twitter accounts) and hyperlinks have been added. In this issue of Among Worlds, we begin a regular column called #TCKchat. Freelance writer and #TCKchat co-host Dounia Bertuccelli provides an introduction to #TCKchat, where to find more information and how to get involved. When it comes to Third Culture Kids (TCKs), it is complex to find a one-size-fits-all answer. Despite sharing certain similarities, each TCK experience is unique and deserves to be heard. In this day and age of technology and social media, it is easier than ever to share thoughts and ideas with a global audience. Connecting with people across the world in an instant is something many of us do on a daily basis. For TCKs, this can mean keeping touch with family and friends, but also with other TCKs, with whom they feel understood and accepted. Adult TCKs Amanda Bate and Ellen Mahoney understood the importance of those connections and created a space where they could be nurtured and developed: #TCKchat. What is #TCKchat and Why Was it Developed? The Third Culture Kid Chat (#TCKchat) is a twitter chat focused on topics related to the experiences of Third Culture Kids (TCKs) and adult TCKs (ATCKs). It is a public discussion forum, providing insight and information to help support current and future generations of TCKs. As adult TCKs who started their own businesses catered towards supporting TCKs during crucial transition periods, Amanda and Ellen have both the personal and professional experience to lead such a project. They both work with young adult and college age TCKs through their organizations Bate Consulting and Sea Change Mentoring. Participants are of different generations and backgrounds (personal and professional) and are located across every continent except South America. The nine co-hosts are also from around the world and are currently living in Turkey, U.S.A (various states), Australia and Zimbabwe. #TCKchat also aims to provide information, tips and insight to adults who work with or are raising TCKs. It can be a difficult experience to understand if you haven’t lived it, but “our discussions can be a tool for those who work with them [TCKs],” Amanda hopes. Anyone can participate in #TCKchat, as long as they have a Twitter account. There are no restrictions of any kind, and no obligation to answer the questions presented. There is, however, an unspoken understanding that all involved will be respectful. #TCKchat occurs on the first and third Wednesday/Thursday of each month with 2 sessions: 1st session at GMT 15:00 and 2nd session at GMT +1 3:00. To make participation easier, use applications like Tweetdeck or Hootsuite. You can find a video on how to install/use these on the #TCKchat website, and the co-hosts are always happy to provide further assistance. Use #TCKchat in each tweet so everyone in the chat can see/read your tweets. All questions will be available on the website the Sunday before the chat, but they will also be tweeted out at intervals during the chat. If you do not have a twitter account but would still like to read what was shared, the #TCKchat team has you covered: highlights of each chat are posted the following day and those are available to everyone. Identity: How adult TCKs view themselves locally, nationally and globally. There are a lot of insightful, touching and humorous comments made in every chat, but unfortunately it would be difficult to share highlights from all of them in one article. For this first column, I have included some tweets from topics that align with this issue’s theme of Dating and Relationships. #TCKchat is steadily growing and we’re always happy to welcome new participants. The hope is that it will continue to reach TCKs across the globe and provide a welcoming environment for thoughts on this transient lifestyle and its impacts. #TCKchat is a community where you are understood, accepted and embraced. #TCKchat is held on the first and third Wednesday/Thursday of each month with 2 sessions: 1st session at GMT 15:00 and 2nd session at GMT +1 3:00. To figure out when #TCKchat happens in your time zone, visit www.TimeandDate.com On the website, you will find upcoming chat dates and topics, highlights from past topics, a video showing you how to get involved/participate in #TCKchat and information on all of the co-hosts.